Very rich nose that is hard to decipher. Time rewards you with this one. While the taste is full, it can get overshadowed by tannin. Thankfully, the finish sweeps in and hangs forever, taking its time to slowly yield those delicious creamy, nutty citrus notes. If I drank this blind, I’d hazard it would be an aged rum with the tropical fruits and fiery baking spices. 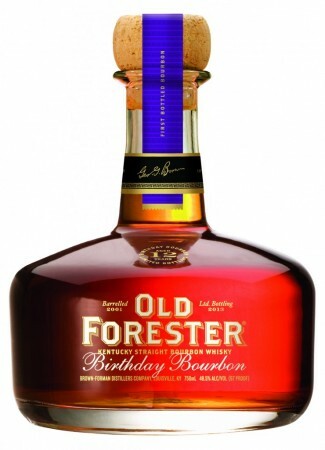 Unique as always, Old Forester Birthday Bourbon is always a welcome release, with this one packing tons of flavor. At the very least, it is definitely better than past releases, but for my tastes, I think this one falls short for its heavy tannin. Which is why it underscored my favorite last year, the 2012 Birthday release. For more than 140 years, Old Forester has been crafted using the time-honored methods established by George Garvin Brown, the founder of Louisville-based Brown-Forman and Old Forester, America’s First Bottled Bourbon™. To commemorate Mr. Brown’s September 2nd birthday, Old Forester annually releases an expression of its highly-acclaimed bourbon and this year marks the 12th limited edition release.